This little-known town in the Golden Ring boasts a medieval cathedral worth visiting. Each year thousands of visitors make their way north and east of Moscow to the ancient centers of medieval Russia – Vladimir, Suzdal, Rostov and Yaroslavl, to name only a few. Collectively known as the Golden Ring, these towns – together with Novgorod and Pskov –provide through their architecture and art a view into the deepest sources of Russian culture. The Golden Ring has other sites, however, that are less well known and all-too-rarely visited by tourists. Yuriev-Polski is among the most beautiful of these neglected corners. Although lacking passenger rail service, the town is readily accessible by road, either from Pereslavl Zalesski or from Vladimir, both of which are served by major highways. Indeed, the paved secondary roads provide a view of picturesque countryside, marked by village churches and unspoiled by advertisements and other detritus of the main roads. Yuriev-Polski was founded in 1152 by Prince Yury Dolgoruky in an area of gently rolling fields and meadows that provide its name: Yury of the Fields. 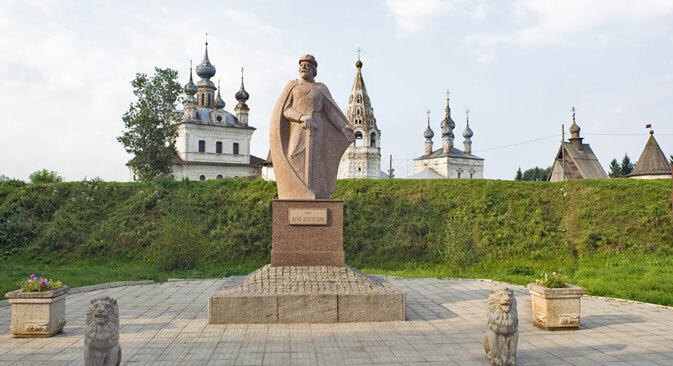 The area's fertile soil attracted Slavic settlers from Kiev, and it soon gained a respected place in the Vladimir principality ruled by Vsevolod III (1154-1212). With the distribution of lands among Vsevolod's sons in 1212, Yuriev-Polski became the seat of a small principality under Sviatoslav (1196-1252). In 1230, Sviatoslav ordered the rebuilding of the Church of St. George, erected by his grandfather Yury Dolgoruky in 1152. Completed by 1234, the new limestone Cathedral of St. George was covered with intricate carving. When the upper part of the church collapsed in the 1460s, Ivan III, the grand prince of Moscow, commanded architect Vasily Ermolin to rebuild the structure. In 1471 Ermolin succeeded in rebuilding the church from the ruins, but the new structure showed little concern for the original appearance. Given the lack of documentary materials, this difference was inevitable. Indeed, the original design was probably unstable in its high elevation of a large drum and cupola above the unbuttressed main walls. Furthermore, the patterned carving that covered the facades could not have been recreated without time-consuming attention to detail. Many of the carved blocks were restored to the new walls haphazardly. Other carved blocks were used for the vaulting or hidden with structural components, and many were pilfered by those who lived around the ruined church. Much of the surface, therefore, resembles carved chaos, with some intervals preserved from the original. In its basic form, the Cathedral of St. George is a cuboid structure with three extensions containing the portals of the north, west, and south facades. Because it lacked a choir gallery, the interior of this four-piered church is unusually spacious and well illuminated by two tiers of unobstructed windows. The wall paintings on the interior were frequently redone. Their current colorful form, dating from 1827, is attributed to Timofei Medvedev, a well-known academic painter of biblical scenes. Yet the more striking iconographic display remained on the exterior. It is thought that the Cathedral of St. George was built to celebrate a major victory of Sviatoslav's forces over the Volga Bulgars in 1220, and consequently the religious scenes, saints and church fathers that appear in relief carving signify the divine protection extended to the prince and his people. Not only are there carved blocks with separate motifs, but there are also at least three large stone icons composed of several blocks. In addition there is a large carving of the Crucifixion known as Sviatoslav's cross, which was reputed to have miraculous powers. It is now preserved inside the cathedral. Many parts of the surface were covered with a low relief vegetal pattern carved when the blocks were already in place. The ornamentation covered all of the lower structure, including the attached columns, which were set within a dense pattern of carved stone. In this respect St. George Cathedral surpasses the Cathedral of St. Dmitrii in Vladimir. The exuberance expressed in the form and decoration of the Cathedral of St. George at Yuriev-Polski is an indication of the relative wealth of the grand principality of Vladimir in 13th-century Rus. Circumstances, however, were soon to change in a disastrous way. In 1238 the small fortified settlement of Yuriev-Polski was devastated during the Mongol invasion that swept through medieval Rus in 1237-1240. The Tatars again sacked the town in 1382 and 1408. During the early 17th-century dynastic crisis known as the Time of Troubles, Yuriev-Polski was devasted by Polish forces in 1612. Like so many other Russian towns, Yuriev-Polski slowly recovered in the middle of the 17th century. Evidence of the revival is seen in the reconstruction of the Monastery of the Archangel Michael, whose gate Church of St. John the Divine was completed by 1670. The main Church of the Archangel Michael, with a tall bell tower standing to the northwest, was rebuilt in the late 18th century and completed in 1806. The picturesque walls and towers were rebuilt during the 18th century. In the late 18th century, the town was reorganized on a grid whose streets were graced with the houses of local merchants. A number of parish churches were also built during the 18th and 19th centuries. The turn of the 20th century witnessed a rebuilding of the commercial district and the market, much of which has been preserved to this day.